There seems to be a lot of confusion over hot banana pepper rings. They are not made from bananas. They are sliced into rings. They are spicy hot. 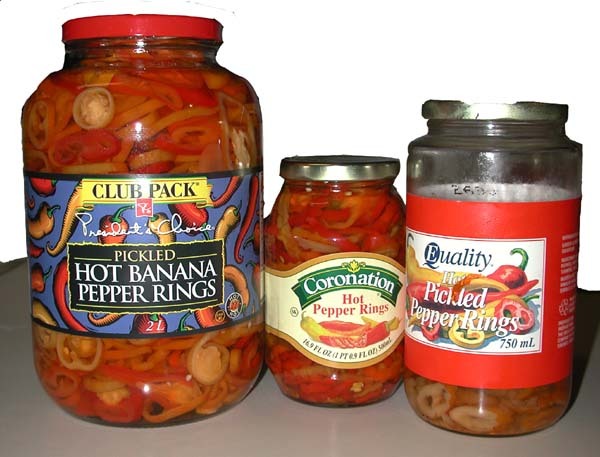 Hot banana pepper rings are popular in Canada. We put them on hamburgers, hot dogs, pizzas and other things. When I moved to California, I was shocked to see that they do not exist here. I looked in all the supermarkets. Before you suggest Trader Joe's like 20 other people, no, they do not have them either. They are popular throughout all of Canada, but I've heard maybe they are available on the US east coast as well. I am not sure if these peppers are grown in Canada or not, but the labels all read "Product of Canada". If you have any information about where these peppers are grown, or what other parts of the world they are available in, please leave a comment. My thanks to my friend Duane for bringing me these peppers whenever he comes for a visit from Canada. well, the trader joe's in sunnyvale *does* have them. strub's brand.